Swap out the beef for a meatless meat alternative or even just lentils! 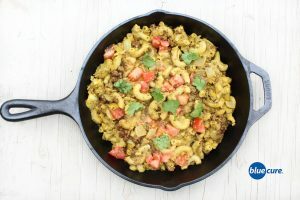 Our vegan cheeseburger macaroni was inspired by Betty Crocker’s Hamburger Helper. It is creamy, delicious, and totally satisfying. Plus, we’ve left-out all the unhealthful ingredients and additives— like yellow lake 5 & 6, and partially hydrogenated soybean oil—- that you’ll find in a box of Hamburger Helper. And loaded ours up with healthful ingredients like lentils, tomatoes, turmeric, paprika, cashews and more! Cancer prevention never tasted so good! Follow instructions on the noodle package and cook the noodles until al dente. If using lentils, combine the lentils and 3 cups water into a sauce pan. Bring to a boil. Once boiling reduce to medium heat until lentils are all cooked and water is steamed off. Add the cooked lentils to the noodles. If using frozen meatless meat crumbles, thaw in the microwave or on a pan. Add to the pot with the noodles. Wash and chop the veggies. Lightly sauté the onions. Then add greens, tomatoes, and cooked onions to the pan. Cook until desired texture, then add to the noodles. Combine cashews, spices, tomato paste, and 3/4 cup water in a blender. Blend until smooth. Add more water as needed. Pour the cheese sauce over the noodles. Cook on low heat until warm and stir often to avoid burning the cashew sauce. Serve with a side salad or steamed broccoli. *If your blender is not strong, soak cashews in warm water for 20-30 minutes to soften. Note: For people with nut allergies, swap in a ½ cup sunflower seeds for the cashews.